The global market for cervical dysplasia features a highly consolidated competitive landscape, with the top three companies accounting for more than three-fourth of the overall market in 2017, observes a recent report by Transparency Market Research. These top vendors, namely Qiagen AG, Hologic Inc., and F. Hoffmann-La Roche Ltd, have strengthened their hold on the market owing to strategies such as collaboration with leading pharmaceutical and biotechnology companies and successful and focused R&D activities. Low product penetration clubbed with vast untapped growth prospects across developing economies is a key incremental opportunity for market players. Thus, companies could benefit from increased focus on strong promotional campaigns in developing economies where nearly 90% of cervical cancer deaths occur on an annual basis. Transparency Market Research estimates that the global cervical dysplasia market will exhibit a healthy CAGR of 7.2% over the period between 2017 and 2024. If the prediction holds true, the market, which valued at US$394.0 mn in 2017, is expected to rise to US$640.2 mn by 2024. In terms of diagnosis, the global cervical dysplasia market is dominated by the diagnostic tests segment, which accounted for over 86.3% of the overall market in 2017. The rising awareness regarding cervical dysplasia and the vast rise in cervical cancer screening programs in developed countries are the key factors attributed to the high share of the segment in the global market. Geographically, the market earns a large share of its overall revenue from developed regions such as North America and Europe, which collectively accounted for over 80% of the overall market in 2017. The trend is expected to remain strong over the forecast period as well. Nevertheless, emerging economies across regions such as Asia Pacific and Latin America also present highly promising growth opportunities. Funds invested by governments towards several healthcare screening programs in a number of developed countries with the aim of preventing several high-incidence cancers are key to the overall development of the global cervical dysplasia market. Over the forecast period as well, the impact of this factor on the overall development of the market is expected to remain significantly high. The rising number of people to undergo cervical screening tests such as Pap smear, HPV, and colposcopy owing to such government initiatives is an excellent growth area for market players. Pap smear tests currently hold a significant share in the overall market for cervical dysplasia diagnostic tests. The trend is primarily attributed to the immense success of widespread Pap smear screening programs undertaken in developed countries. In the past decade, however, the number of Pap screening tests has drastically come down, chiefly owing to less than optimal Pap test characteristics, with about 25% to 40% false-negative rate despite the implementation of extensive quality assurance standards. This potential for missing out on critical cervical cancer symptoms with Pap screening alone has led to the development of enhanced cytology-based screening technologies and increased research activities aimed at understanding the etiologic role of human papillomavirus in causing cervical cancer. The resultant advancements in HPV screening technologies have made HPV testing one of the primary cervical cancer screening tools in the past years, allowing this segment to largely surpass the business of Pap smear screening tests. 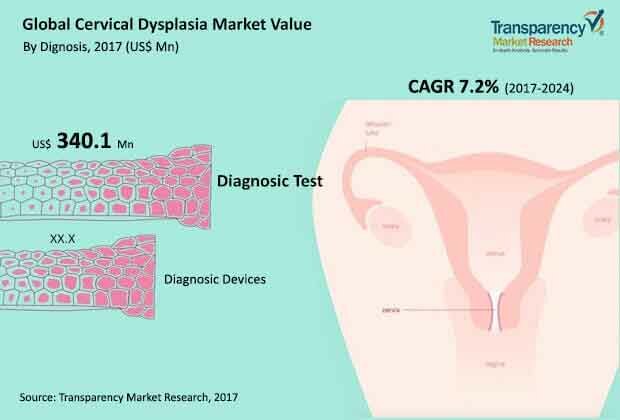 Although this factor presents an incremental growth opportunity for players in the HPV testing market, the aversion to the lucrative Pap smear screening test segment is expected to hamper the global cervical dysplasia market in the near future.